I have thought over and over again about why I never learned to swim. I am not 100% sure what happened. I guess that I just never had lessons as a child and the opportunity never presented itself either. I wasn’t a member of the local Boys and Girls Club – and apparently we did not do lots of summer camp. My parents are not really swimmers, and I am sure that hair played a role (more on that in another post) So, here I am as a non-swimming adult. This is not my first stab at learning to swim. I took lessons in college. I got a bad cold and dropped out. Thank GOD I did not attend a HBCU (Historically Black College or University) where swimming is a requirement of graduation. I might have never graduated. I also took lessons while pregnant with my middle child over 6 years ago. It just did not “stick”. I had the maternity swim suit and everything! I did however find that my constant fighting with the water was great exercise and I gained about 22 pounds with the pregnancy and then delivered a nearly 10 pound baby boy. Half of the baby weight gone in the delivery room and still a non swimmer. But, I was determined to try again and I did. I convinced my father to take swim lessons with me at his local YMCA. He told me that he could not swim. I felt like I could do it this time. I had a partner. We arrived at swim class, hopped into the pool with my dad and was ready. The instructor said to the group “Let me see what you can do.” I quickly replied “I cannot swim at all.” I looked at my father who then puts his head in the water and proceeds to SWIM to about 5 feet deep of water and then swim back to where I am standing in the (very) shallow end. Feet kicking, arms moving he glides through the water!!! I am 100% confused! He says “Well, I can’t swim in deep water.” Apparently he “learned” 50 years ago at the Boys and Girls Club back when your friends just shoved you into the pool and you sank or swam. Apparently he swam. So, from day one we were in separate groups within the same class and by class #2 he is in the “other end” (not the deep end). I finish the class the way I started, as a non-swimmer. But I guess that on some level it was good bonding time for me and my dad. I am the only non-swimmer in my home. My husband and three children all are swimmers of varying degree. My youngest two are in lessons now at our local YMCA and my oldest is a great swimmer, also trained at the YMCA and through summer camp. My little ones ages 4 & 5 currently ask why I cannot swim and today even said, “Mommy when we get to Florida in August I am going to help teach you to swim.” Well, now that’s very nice of them but the idea is to be swimming before then. If they can learn then so can I right? There was a time when I had a list. A list of 40 things to do before I turned 40. The list included things like… snorkeling, travel to Europe (again), go skiing at least once, build a (good) snowman and learn to swim among other things. Well, where did the time go? Here I am quickly approaching 40 and I haven’t yet done many of these things. 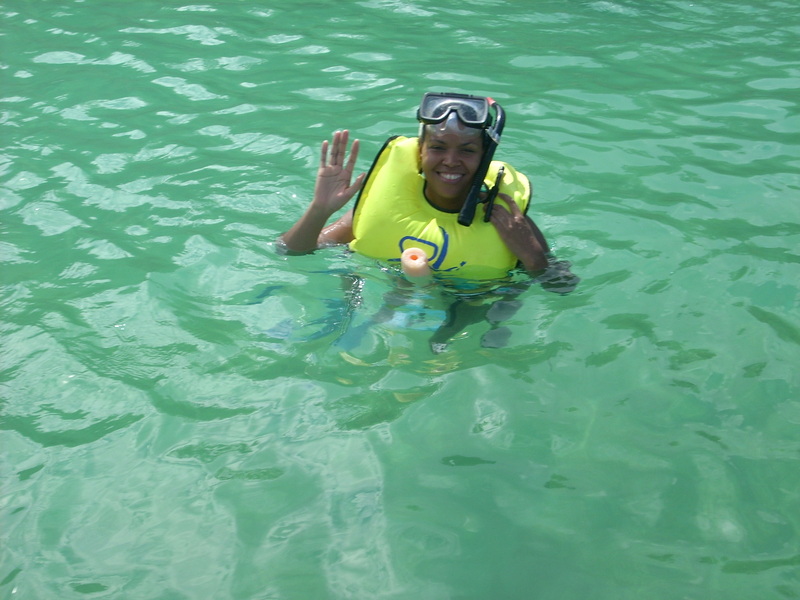 I got the snorkeling in with lots of flotation devices attached (looking semi-ridiculous), while my son and his friends jumped feet-first, head-first, backwards and any direction into the ocean in Bermuda. Did I mention that I cannot Swim? So, while there are lots of things that I can blog about – I will start here. Perhaps this will keep me honest and in the water.